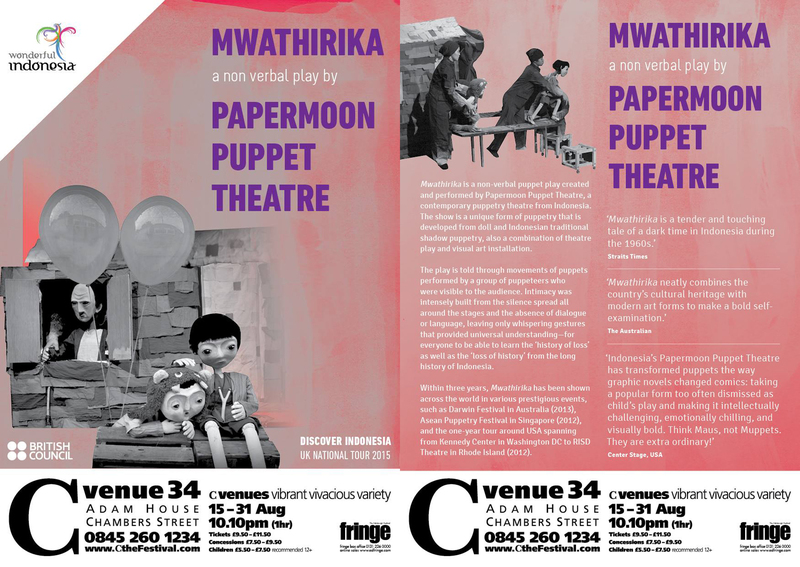 Mwathirika is a non-verbal puppet play created and performed by Pappermoon Puppet Theatre, a contemporary puppetry theatre from Indonesia. The show is a unique form of puppetry that is developed from doll and Indonesian traditional shadow puppetry, also a combination of theatre play and visual art installation. The show is about the lost history of a nation. The theatre has transformed puppetry the way graphic novels changed the perception of comics: taking a popular form too often dismissed, and making it intellectually challenging, emotionally chilling, and visually bold. Think Maus, not Muppets. ‘They are extraordinary!’ (CenterStageUS.org) ‘Mwathirika is a tender and touching tale of a dark time in Indonesia during the 1960s’ (Straits Times). Tickets can be booked from the link provided below.